Stevie, Author at Ho Stevie! 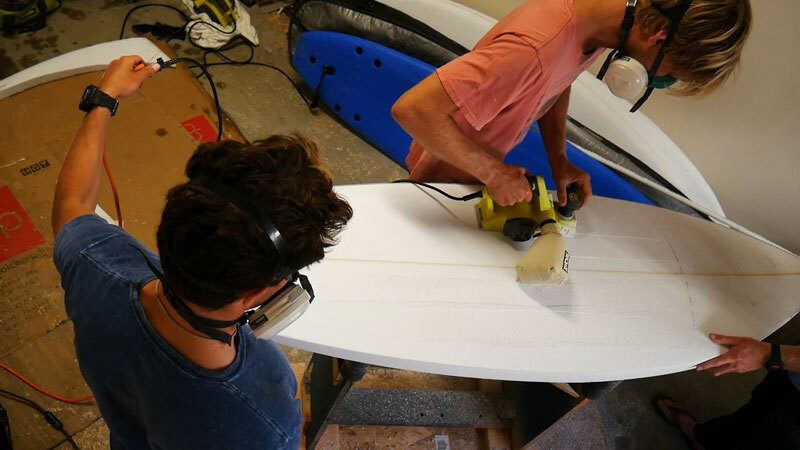 Have you been wondering what it’s like to shape your own surfboard? Depending who you talk to to, it could be a piece of cake, or a daunting task that no man should do by himself. 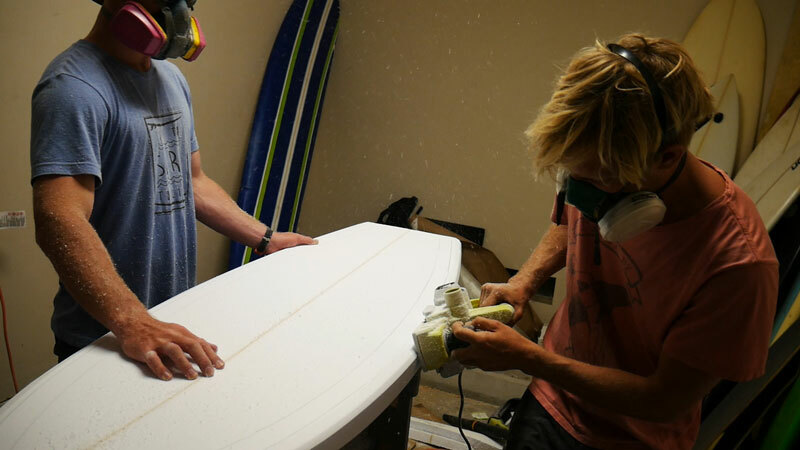 When my buddies John and Frank offered to walk me through the process of how to make a surfboard, I couldn’t refuse. This is less of a “How To Make a Surfboard” with all the technical knowledge, and more of a “How I (Poorly) Made a Surfboard That Some Thought Wouldn’t Surf, But It Does”. You can learn from my mistakes, and hopefully avoid making the same ones if you decide to shape and glass your own surfboard. The three of us decided we all wanted to shape fish surfboards. I had been riding my Lunchtray a lot, which is super fun, but not very maneuverable. But every time I took out my shortboard, it felt like I was surfing a noodle. So I wanted to shape something in between. 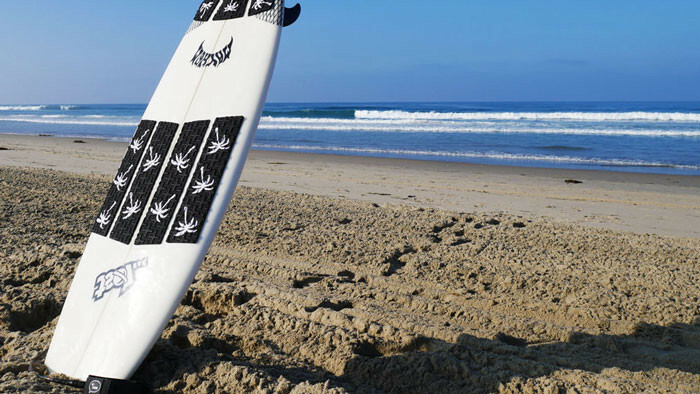 A fish surfboard has more volume and less rocker than a shortboard, so it’s easy to catch and ride mushy waves (San Diego summers hello), but still very maneuverable. First task was making a template for the outline of the fish. Got some “hardboard” (aka masonite?) from Home Depot for this, along with some PVC pipe to bend for smooth curves. $22.88 split 3 ways, $7.63. We made a similar outline to John’s old fish, because I rode that board and really liked it. 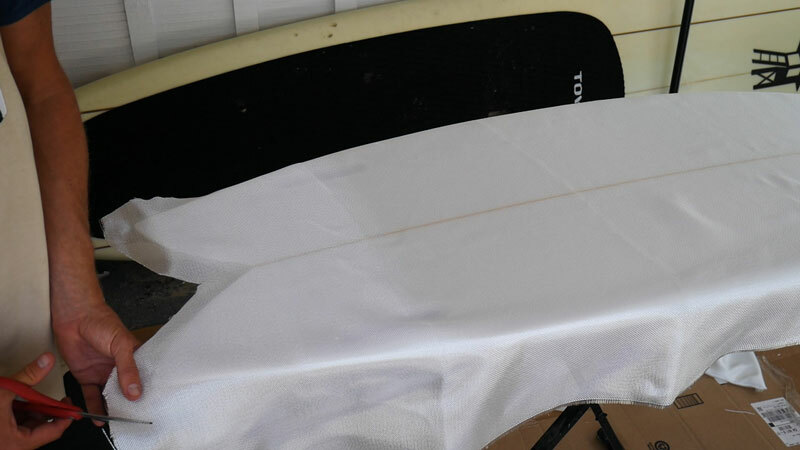 The foam blank is the inner core of your surfboard, and there are a bunch of different sizes you can choose from, depending what board you want to shape. I bought my foam blank from Mitch’s Surf Shop, and if you’re in San Diego that’s probably where you will want to get yours. I didn’t rent a shaping bay or anything, we just did all of the shaping in John’s garage. You adjust your template towards the nose or tail of the blank, depending where you want your rocker (the blank has rocker built in, so you don’t need to do as much sanding). Then just trace the outline of the template onto the foam blank. Using a handsaw, cut the along the outline on the foam blank, keeping the saw straight up and down. Oh, and remember to wear a face mask or respirator… there’s gonna be lots of foam dust flying around. Next we brought out the planer and started shaving some thickness off the blank. Then it was time for some rail work. After making some outlines for the rails, we took off some foam with the planer and then the screen. (Add $8.50 to the running total, for sanding supplies. From there, it was just a lot of slow sanding with various tools, making minor changes to the foam blank, until we had the perfect fish shape I wanted. The boys decided we should just take our shaped blanks to a local glasser, instead of glassing them ourselves. Frank did let me borrow some much needed tools for installing the fin boxes (template, router, and jig). I made quick and dirty work of that. $113.83 for all those supplies. Time to lay down the glass! I brushed off the foam blank, and laid down the fiberglass cloth. I cut the cloth so it hung a couple inches over the outline of the blank. Now for the tricky part… the resin. The guys at the surf shop told me to use the whole jar of tint for this project… I think this was a big mistake. I’ll tell you why in a minute. They also didn’t know how long the epoxy resin takes to cure, and the label didn’t have any timeframe either. So I went ahead and mixed the resin with the hardener and the black pigment. I didn’t know how long it would take for the resin to harden, but I knew I had to hurry! Unfortunately I forgot to tape off my fin boxes, so after I poured resin in the fin box area of the foam blank, I had to fumble and tape the fin boxes with my messy gloves. Inserted the fix boxes into the foam blank, and spread the resin over them. Now I had to spread the resin across the whole bottom of the surfboard, but I didn’t quite spread it liberally enough. The resin started getting thick as I was spreading it across the board, and that made it pull on the fiberglass cloth, so I had to stop. I quickly mixed up a small batch of clear resin, and worked that around the rails, tucking the cloth under the rails as best I could. This somewhat salvaged it. A few hours later after the resin cured, I flipped the board over and cut off the excess cloth (laps they are called) from the rails. It wasn’t pretty, but it wasn’t totally ruined. Time to repeat those steps, but for the deck of the surfboard. Only this time I knew I had to work faster. I spread the resin liberally and quickly, and it went a lot better! Waited about 6 hours and went to town with the disc sander. Actually I should have sanded even more than I did, but I thought it was good enough. 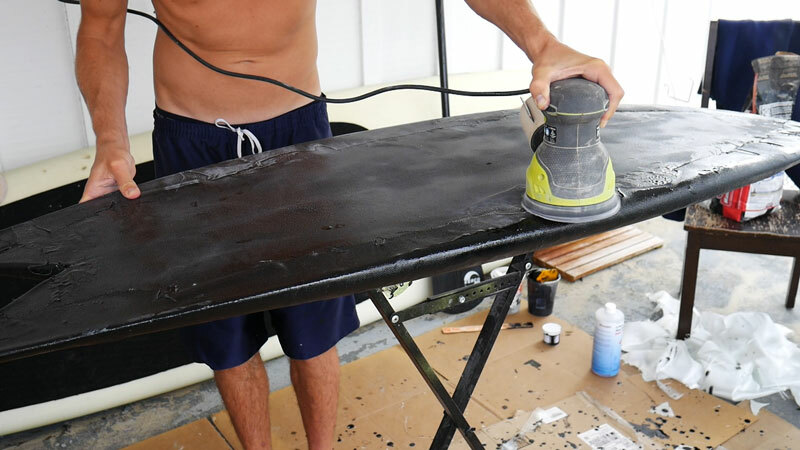 At this point I wasn’t even sure if the surfboard was going to work… the rails were all lumpy, and the first coat wasn’t very hard. Like I could dent it in with my thumb. But I couldn’t quit now… on to the hot coat! The hot coat was much easier. All I had to do was brush a thick coat of resin onto the surfboard. (I didn’t use pigment in this coat, so it cured fully hard). Of course it wasn’t perfect… there were tons of little air bubbles. Like when I used to make cakes with my mom, and she would gently drop the pan a bunch of times to pop the air bubble. Except I couldn’t do that with my surfboard. So after letting the hot coat cure, sanding the whole surfboard again, applying front and rear traction pads (goodbye wax), I had a fish surfboard that didn’t really look like the glass job would hold up to my surfing. It was just what I wanted… in between my Lunchtray and shortboard. Fun and playful, but still easy to catch waves with all its volume. I was surfing on surfboard that I made myself. Let me tell you, that’s a good feeling. That being said, making this surfboard was a LOT of work! I don’t know which part was worse, the shaping or the glassing… well John and Frank did most of the shaping for me, so clearly the glassing was worse for me. The glassing had to be spread out over a few days, because each coast of resin had to cure for several hours. Slide into John’s (@toob_king) and Frank’s (@fderubes) DM’s if you want to talk details about shaping and glassing… they love that stuff. This was the first surfboard I ever shaped, and very well might be the last. 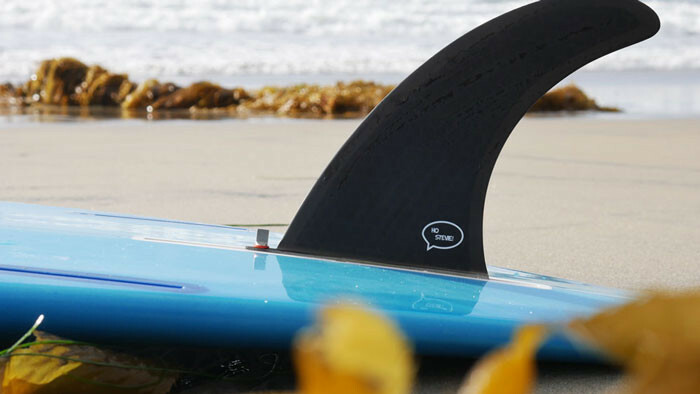 So what do you think… do you still want to make your own surfboard? The dreaded black ring around my neck after surfing. 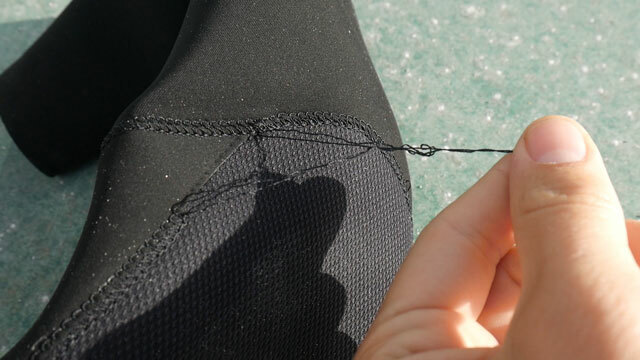 It seems to happen to all of my wetsuits after 2 or 3 years. 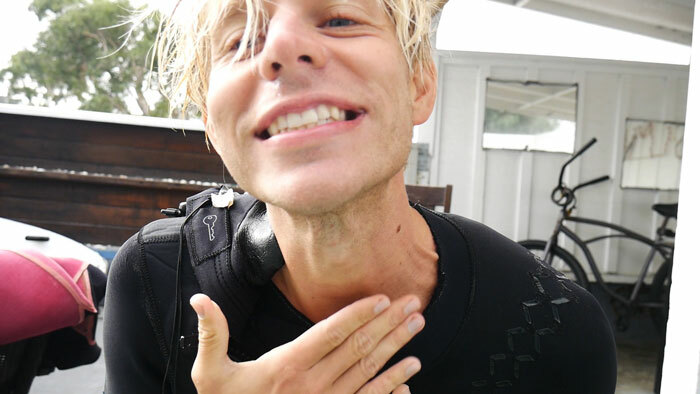 The neck of the wetsuit starts to “melt” onto my neck. The latest victim is my 3/2 Xcel Drylock. It feels gross, and I have to scrub it off with soap and paper towel after every surf. But hey, I can’t just ditch a $500 wetsuit, so I decided to get crafty. $11.95 and two Prime days later, I had the solution: Aquaseal neoprene westuit cement. This stuff comes out like gooey paint, and dries into a somewhat flexible rubbery coating. I worked on half of the neck at a time, because it was too tricky to do the whole neck at once. After letting it cure overnight just to be safe, I tested it out the next morning. While it felt a little “crustier” than normal, it still sealed the water out pretty well, and didn’t leave any black marks. It’s always hard to decide. It was perfect timing to get this wetsuit, because the water temps were dropping in San Diego, and I was getting chilly! My Xcel 3/2 is a couple years old and letting in some water, and even my 1-year-old 7TILL8 4/3 wetsuit is pretty ragged. So I put the Hurley Advantage Plus to the test, to see if this 3/2mm was warmer than my year-old 4/3 from 7TILL8. LOVE the fit on this wetsuit! I’m 6’1″, 155lbs, and the Medium Tall size fits me perfectly. Good length on the ankles and wrists, and it hugs the jewels nicely 🤗 (Unlike the baggy-ness on my 7TILL8). Really easy to get on and off. PS… do yourself a favor and cop a changing poncho. I’ve gotta say, I think this 3/2 Hurley Advantage Plus is just as warm as last year’s 4/3 from 7TILL8. Ho Stevie! 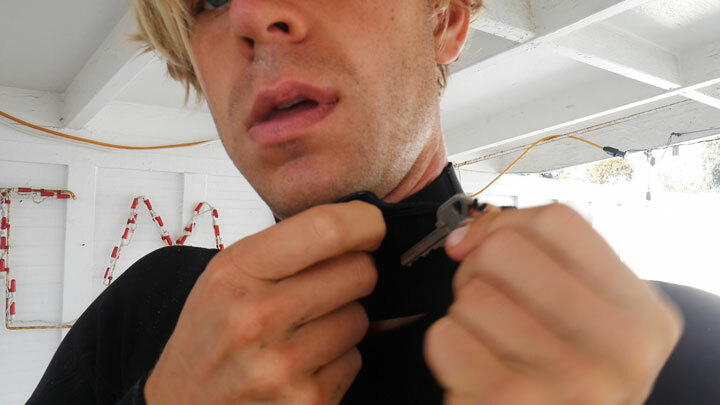 leashes have a key pocket in the ankle cuff, but I prefer to keep my key in my wetsuit. But after surfing in this wetsuit for about a month, I noticed that the stitching on one of the knees is starting to unravel. I’ve contacted Hurley about this, but they haven’t gotten back to me yet. Besides that problem, I really like the Advantage Plus. Oh, and the white stripes on the leg are subtle, yet help your friend on the beach pick you out from the crowd. I’ll update this post if I hear back from Hurley about the knee stitching. Who’s on the Hurley bandwagon? So Back in December, I DM’d Hurley on Instagram and Facebook, and they gave me an email address to contact (hurley_store@hurley.com if you need it yourself). I emailed them December 7th explaining this situation, with a link to my video. Finally, 5 weeks later (January 15th) I received a response. After a little back and forth (they needed more pictures, model number, etc) they agreed to replace the wetsuit. Now, did they only give me this treatment because of my Youtube channel and blog? Quite possibly. I always wonder in situations like this. Airlines are notorious for damaging surfboards (after you pay loads of money to get them on the plane). Here’s how to pack your board to prevent damage during airplane travel. 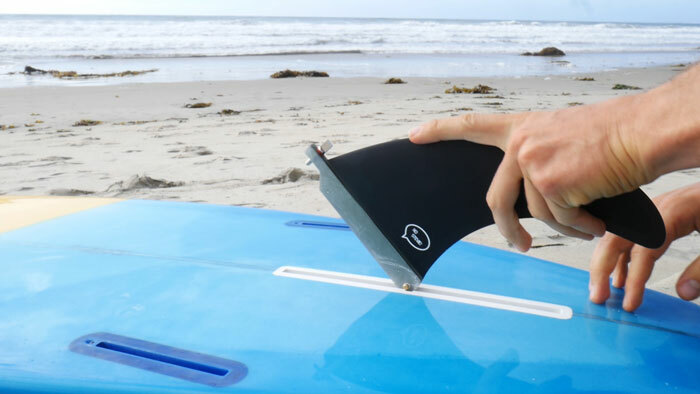 It’s never guaranteed that your surfboard will arrive safely, but this will add a lot of protection. 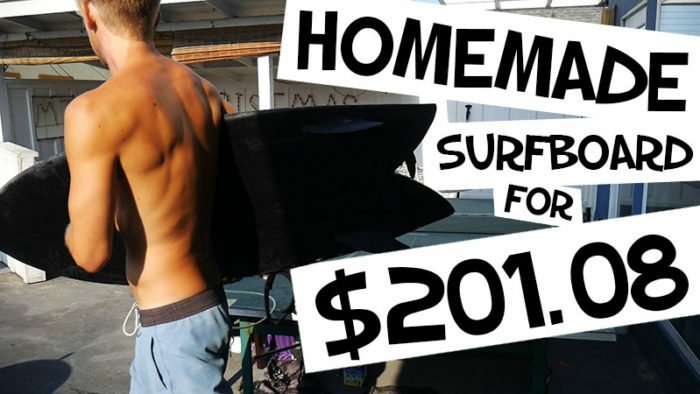 If you have a surfboard bag designed for airline travel (these are really expensive) then you might not need to take these extra steps. But if you have a lighter weight daybag, you’ll want to stack on some padding. The good news is that the supplies only cost a few bucks. All you need is pipe insulation, and masking tape. Get enough pipe insulation to cover the entire length of your surfboard rails. I bought two 6-foot pieces for this video, but I could have used a bit more. You can buy this at any home improvement store like Home Depot. Also pick up some masking tape. 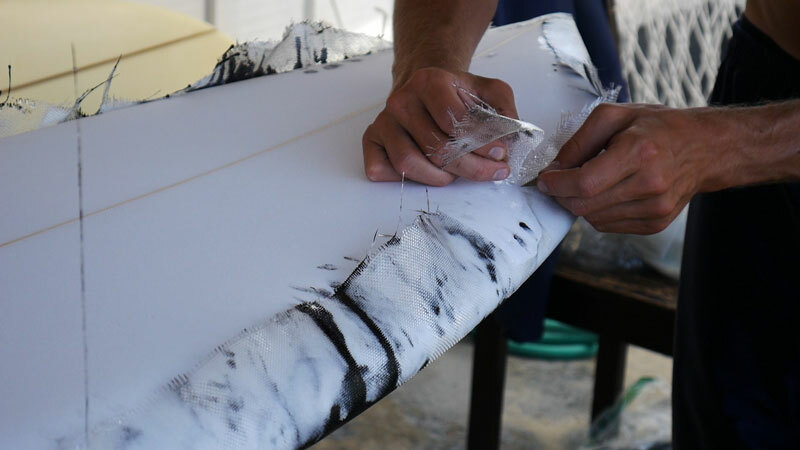 Really any kind of tape will work, but if it’s really sticky (like duct tape) then it’s going to leave residue on your surfboard. And you don’t want that. Painter’s tape is best, as it leaves no residue. 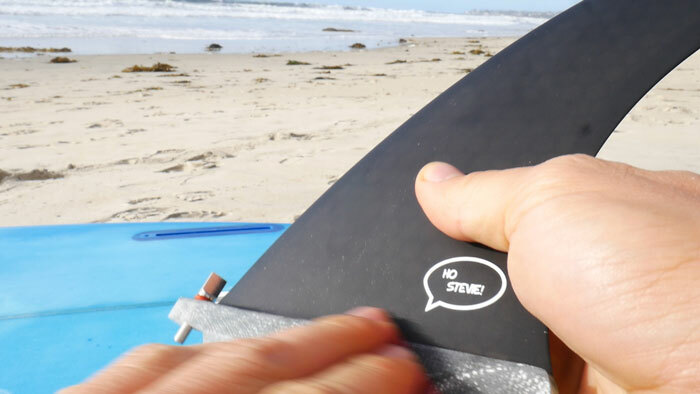 Remove the fins from your surfboard, and put them in the pocket. 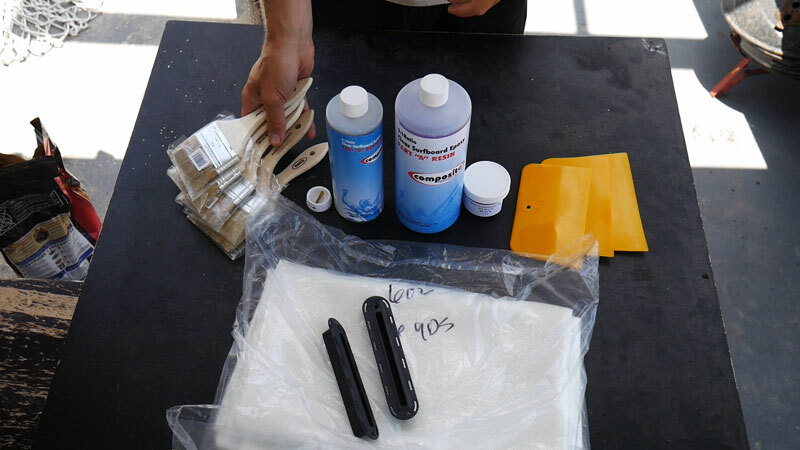 You can also remove the wax from your board if you’re worried about it melting inside the bag. 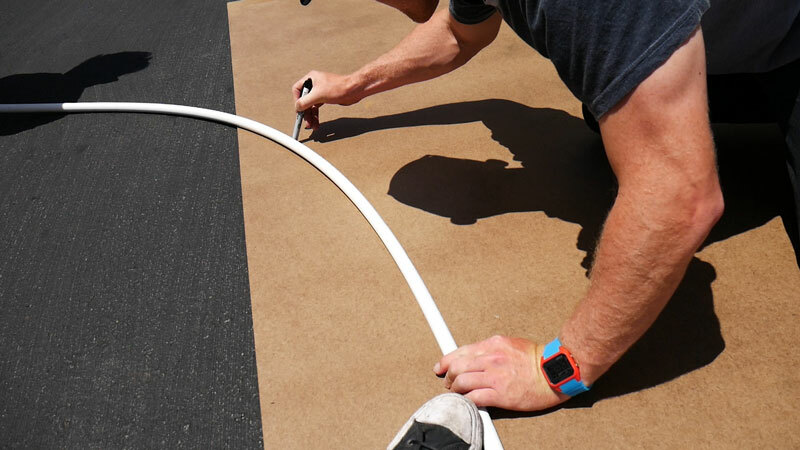 Push the pipe insulation onto the rails of your surfboard, and wrap the tape around your board so the insulation doesn’t come off. Load the surfboard into your bag, and you’re ready to go! You can also throw your towels/poncho in there for extra padding. 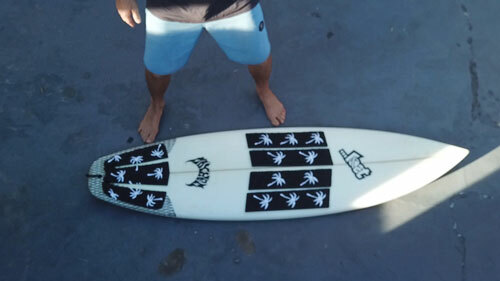 Front traction pads on surfboards are becoming a lot more popular lately. Guys like Noa Deane and Dion Agius have been using deck pads for a while now, but there’s a swarm of more “average” surfers using them now. 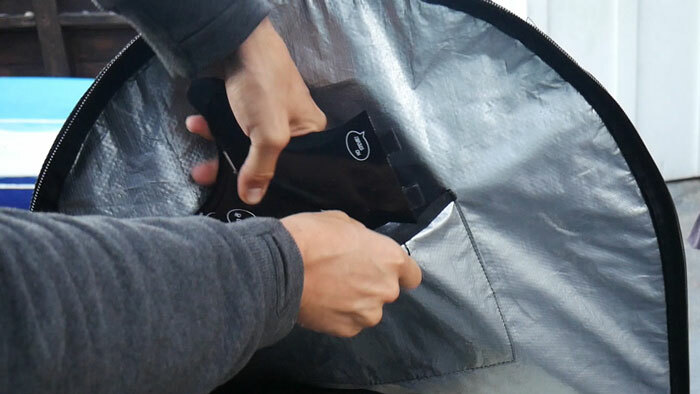 With a front pad, you eliminate the need for wax on your board. 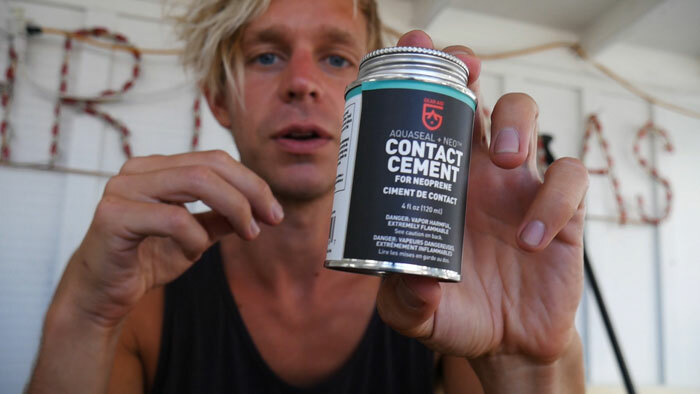 No waxing it up before every surf session, no worrying about it melting all over your car or off you board when you leave it in the sun. Just good traction. There for you every day, like the perfect marriage partner. Actually better than a partner, because once the pad is on your board, it requires no maintenance. 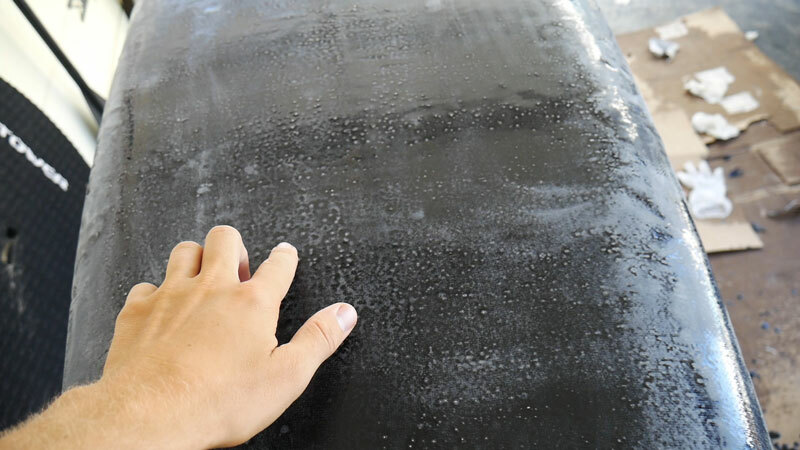 Remove any wax from your board. Leave it in the sun so the wax starts to melt, then scrape it off. Remove any residue with your choice of household cleaner and paper towel. 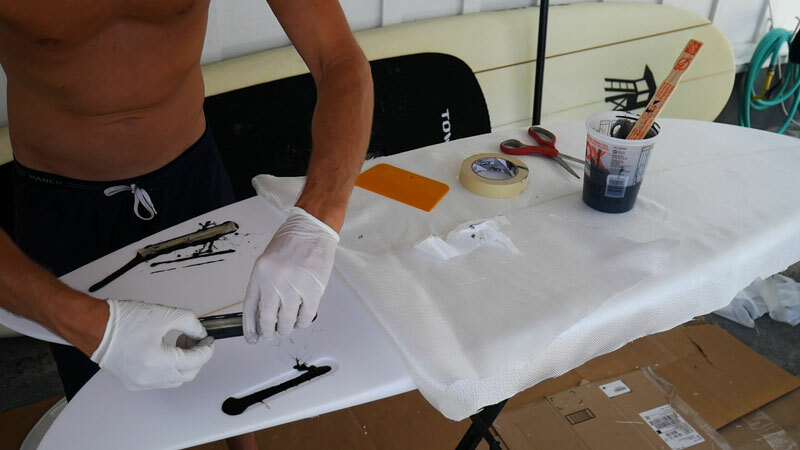 It is​ very important to have a clean board before you apply the pads, otherwise they will not stick properly! Lay the pads on your board, to find the perfect placement. Stand next to your board, with your normal stance, to determine where to put the pads. 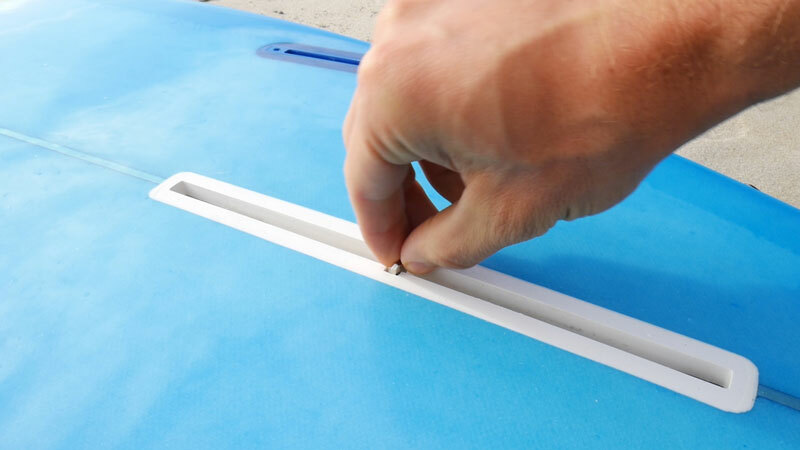 You can mark on your surfboard with a pencil or marker, where you want the pads to go. Carefully peel the backing off pads, and lay them on the board, one at a time. 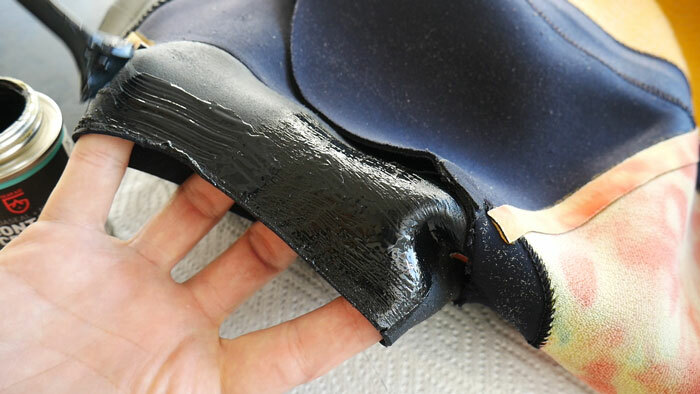 Firmly press on the entire area of the pads so they properly adhere to your board. Wait 24 hours, then go surf! 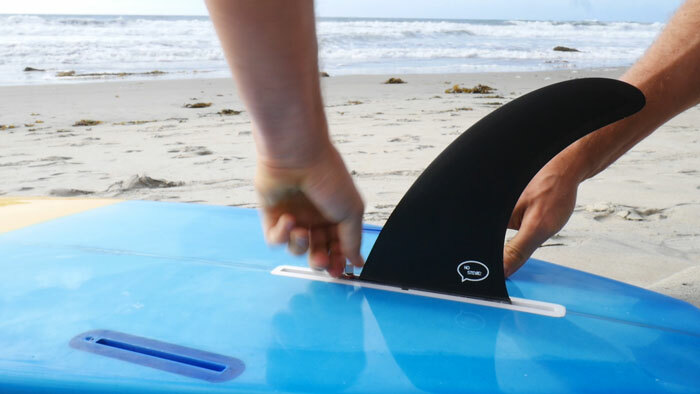 Installing a center fin in your longboard or SUP is extremely easy and fast. It takes less than a minute, and you don’t even need any tools! The installation process is the same whether you have a longboard or SUP… I will be using my longboard in this example. Our longboard fins come with a “no-tool” screw, so you can hand tighten the screw. If you are using a different fin/screw, you might need a screwdriver to tighten the screw. All the other steps in this guide should be the same, no matter what fin/screw/board you are using. 1. Lay the screw plate into fin box. 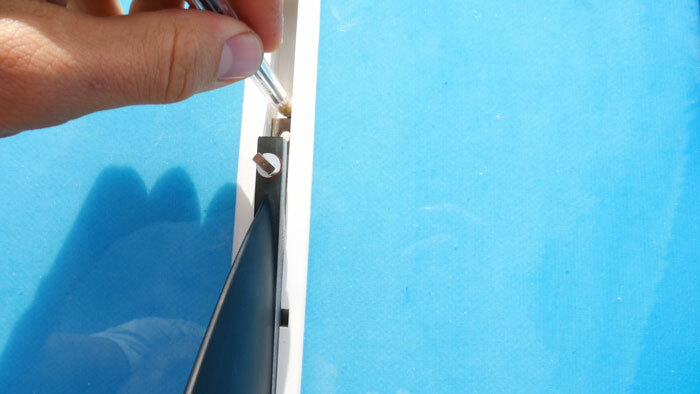 Carefully slide the screw plate into the fin box, and move it towards the front of your board. You can use a pen or screwdriver to move the plate, because your finger probably won’t fit in the box. 2. Insert fin into box. The back of your longboard fin has a pin in it. You insert this part into the middle of the fin box, and then slide the fin back (with the front of the fin still lifted). Find your desired position for the fin. Position is all preference… the farther back the fin, the more stable it will be. The farther forward the fin, the more maneuverable it will be. Once your fin is in position, you can push the front of the fin down into the box. If it fits too tight, you can remove the fin and gently sand the sides of the base. 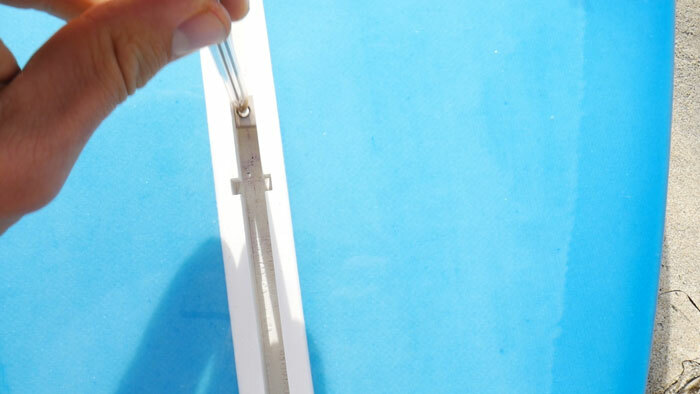 Line up the screw plate with the end of your fin, so the screw can thread in. You’ll want to use a pen or screwdriver to move the plate around. If you have a “no-tool” screw (like our longboard fins come with) you can just hand-tighten the screw. If you have the classic longboard screw, you’ll need a screwdriver to tighten it. 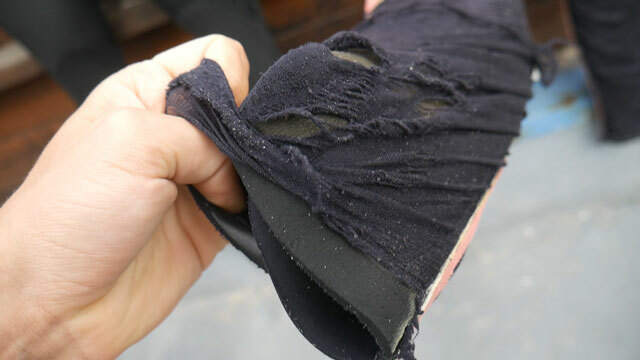 Surfing wetsuits can be expensive. The first two suits cost around $500. The Need Essentials is around $200, but I didn’t like the fact that it doesn’t have a key loop. What am I just supposed to hide my key somewhere while I surf?! I’ve been wearing this suit almost every day for a few weeks now, and I like it! It’s warm (I got the 4/3 version), easy to get in and out of (even with the front-zip), AND it has the key loop! No rips or seams/threads coming undone in the short time I’ve had it, and hopefully it stays that way. My only complaint is about the sizing. 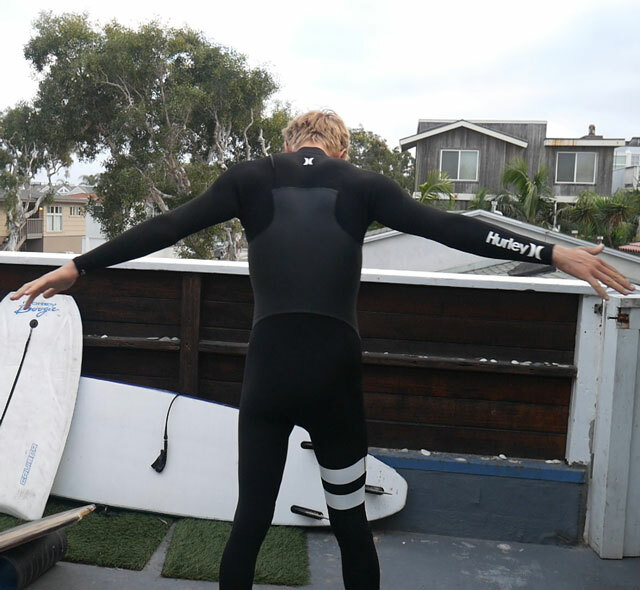 I got size MT (I’m 6’1″, 165lbs) and my other MT wetsuits fit me great. This one was maybe a tiny bit short around the ankles, and pretty baggy in my “junk area”. Not a huge deal though, as I mainly noticed it when walking up and down my stairs, not when I was actually surfing. For $225 you get a nice warm wetsuit delivered to your door. 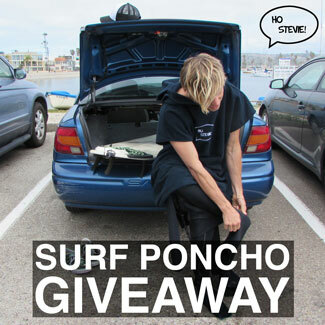 Click here to check out the wetsuit that I got. 19 minutes of surfing from Dane Reynolds, Dillon Perillo, Craig Anderson, Taj Burrow, Dion Agius, Creed McTaggart, Ozzie Wright, and Noa Deane. And a glimpse at Dane’s new brand Former. This footage is from September 10th at the Hurley Pro. Filmed some freesurf action before the heats started, and then watched Jordy Smith and Kelly Slater tear it up! 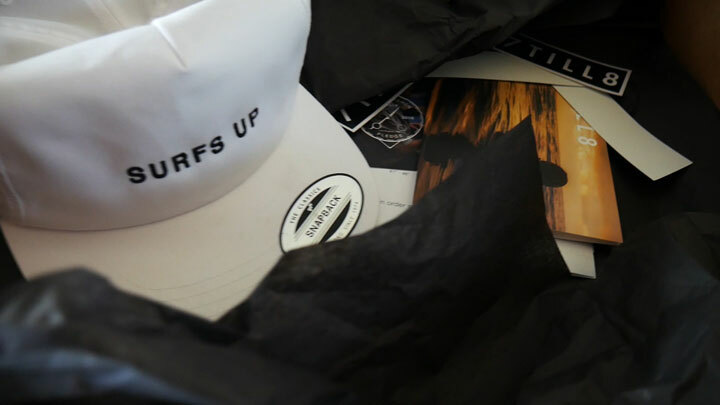 Very cool to see the freesurf stuff, pretty much every wave had someone flying on it. 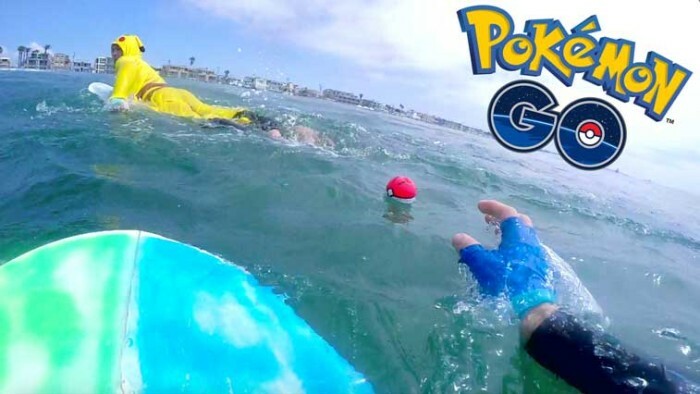 We thought we would hop on the Pokemon Go bandwagon, so we made this video. I’ve never actually played the game, but after watching Casey Neistat’s video, I had a good idea of what to make. My buddy Ian came down for the weekend, and we filmed pretty much all day Saturday, and Ian edited all day Sunday.